On a hot day, or after a weekend of unrestricted brunching, a salad starts to look like the perfect meal (or perfect penance). And if you give any thought to the food pyramid, a salad is a super-easy way to squeeze in your daily rec of four servings of vegetables. Another benefit to eating salad? Gorgeous skin. A thoughtfully made salad has all the nutrients you need for great skin: antioxidants, healthy fats, protein, essential minerals and more. Considering the growing body of evidence linking gut health to skin health, packing your diet with superfood salads may be the answer to your skin probs: acne, wrinkles, inflammation, dryness, uneven tone, and more. 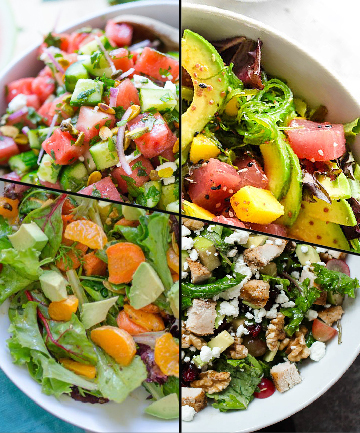 Here are eight delicious superfood salad recipes to try for better-looking skin.